When Bishop Shanley first came to North Dakota, the Catholic diocese was based in Jamestown. Shanley found Jamestown quite problematic to operate out of due its poor location in respect to travel throughout the diocese, a problem that could be solved by moving to Fargo. In addition to the transportation issues, Shanley also saw better potential for growth in Fargo, which resulted in the move to Fargo in 1891. 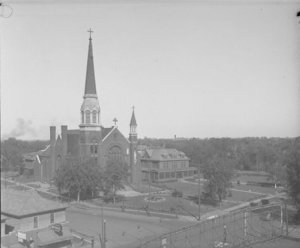 He was not necessarily impressed with the state of affairs in Fargo, but with great dedication Shanley managed to turn it into a thriving congregation. When the fire broke out in 1893 the Catholic Church was saved, but much of the city was left in ruins. Although Shanley desired to build “a cathedral fit for worship”, he deemed the needs of Fargo’s citizens to be more important. At the point of the fire, several thousand dollars had been raised to construct the new cathedral and it was this money that was used to aid in the recovery effort. It was not until May 30, 1899 when the new cathedral was finished. The cathedral not only offered Catholics a place fit for worship, but also provided Fargo with a landmark they could be proud of. Since Shanley had arrived in Fargo, one of his main goals was to promote unity among Catholics and all Christians in North Dakota. Following one of his lectures, an unnamed newspaper editor wrote that his goal was to “…brush away the cobwebs of widespread prejudice prevailing amongst English-speaking people against the Church of Rome the priests and the Pope… He had nothing but the kindliest feelings… but his talk was interspersed with rich roasts of the backsliding, the drunkard, a criminal, and the unbeliever. The Bishop held his audience almost spellbound by this intensely interesting discourse for nearly 2 hours” These sentiments were reaffirmed when Bishop Shanley was invited by Methodist Rev. Eugene May to lecture on the Pope to an audience of non-Catholics. Shanley was also quite concerned with what he saw as the two greatest evils, liquor trafficking and the divorce laws. He dedicated special attention to reducing these evils throughout his career. Having seen the inability of the government to enforce prohibition in North Dakota, he advocated voluntary pledges of sobriety and making the saloons “pay for their sins”. In regards to the divorce laws, he saw them as a threat to marriage and helped to represent the concerns of many religious leaders in Fargo to the state government. It was his efforts, along with those of many other North Dakota religious leaders, that led to the amendment of these laws in 1899. Weber, Gerald Michael. 1951. John Shanley: first bishop of Fargo. St. Paul, MN: St. Paul Seminary. 102. Nice sharing of history. Thank you.